Your New First Choice Chiral Column! The i-Amylose-3 chiral selector is a complementary but distinct chiral selectivity in comparison to i-Amylose-1 and i-Cellulose-5. It combines the 5-position methyl group of the i-Amylose-1 chiral selector with electron-withdrawing potential of the i-Cellulose-5 3-position chlorine group. Combined with the strong solvent flexibility of the immobilization process the Lux i-Amylose-3 column broad enantioselectivity promotes greater chiral separation success. *Lux i-Amylose-3 is a recommended alternative to: CHIRALPAK® IG. Lux is a registered trademark of Phenomenex. CHIRALPAK and IG are registered trademarks of DAICEL Corporation. All such trademarks are used by Chiral Technologies under license from DAICEL Corporation. Chiral Technologies, Inc. is a subsidiary of DAICEL Corporation. How can I reverse enantiomeric elution order? Why does Phenomenex use DEA over TEA as the primary basic modifier in most of their Lux application notes? How do aromatic functionalities in chiral compounds affect selectivity? 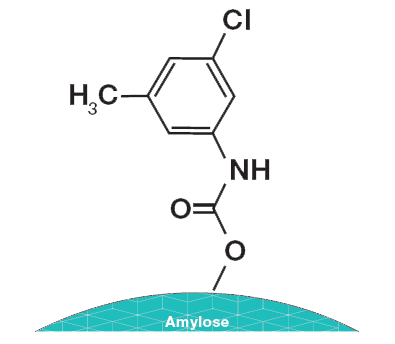 What is the difference between Amylose and Cellulose backbones? What separation modes do Lux Polysaccharide Chiral Columns operate in?